Scott Lang/Ant-Man (Paul Rudd) is under house arrest, for violating federal crimes (as depicted in “Captain America: Civil War”) and is supervised in that arrest by FBI Agent Woo (Randall Park). His sentence is almost up, but he called upon by the creator of Ant-Man, Hank Pym (Michael Douglas) and his daughter Hope/The Wasp (Evangeline Lilly) to help in an experiment in the sub atomic world. While working on that situation, which involves Pym’s long lost wife (Michelle Pfeiffer), the trio encounter The Ghost (Hannah John-Kamen), a creation of scientist Bill Foster (Laurence Fishburne), Pym’s ex-partner. The Ghost wants all of Pym’s technology, because she is slowly dying. But in the meantime, gangster Sonny Burch (Walton Goggins) is also after Pym’s secrets, for potential profit. 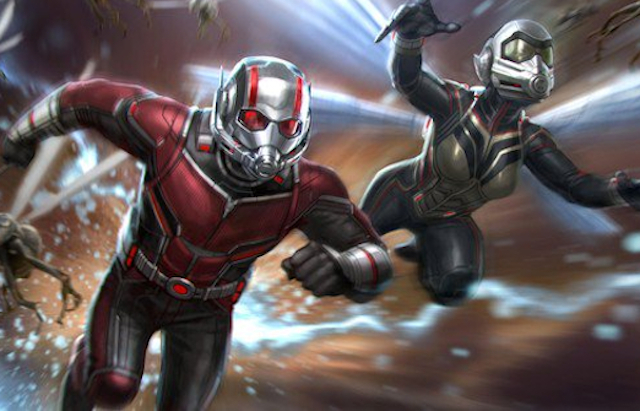 The Ant-Man will have to try on various sizes to for solutions to these problems, with help from the Wasp. 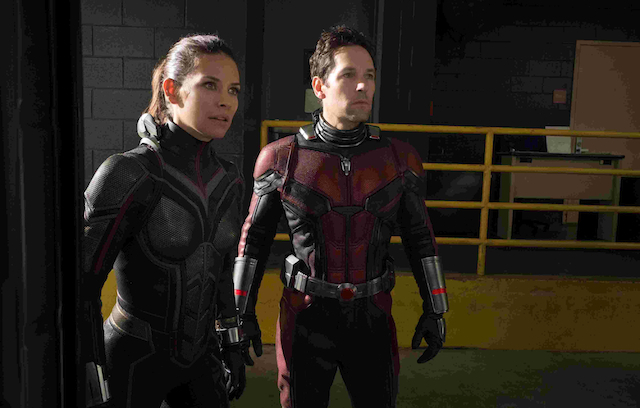 The length and breath of the story, which includes Ant-Man’s crew (The “Antourage” played by Michael Peña, David Dastmalchian and Tip Harris), his daughter (Abby Ryder Forston), ex-wife (Judy Greer) and her husband (Bobby Cannavale) is a crowd of characters that don’t fit evenly within the main story… there needs to be more of the freeform Antourage, for example, and less of domestic Scott. But it’s always more of everything in Superhero worlds, with the law of diminishing (pun intended) returns evident in this second go around. However, Paul Rudd is so darn likable, and still treats Scott’s status as a superhero with wide-eyed and humorous insolence. This is ant-idote (delicious pun) to the multi-layered and redundant story, which is essentially about finding Mommy. The charm of the series is in the ironic commentary on a man who can grow massive or small, the people around who are for/against him, and the laughs. For instance, a bit about seagulls eating Scott’s flying ant army is a scream, and the addition of Randall Park (“Fresh Off the Boat”) as Agent Woo was a good call. Coming up with new places to go, in perspective to what size Ant-Man is at, is part of the entertainment equation. In the first film, when Ant-Man went sub atomic, it played as a “no matter how small, we’re all small” philosophical contemplation. In the latest, it’s just another land where tiny beasts reside. The stakes become clearer toward the ending, but the conclusion to the story left more open ends than closure. It’s become the journey with superhero films, not the destination. Back in the studio era of films, and before television, there were serials in which kids would come back every Saturday to watch, with their own cliffhangers and universes. Superhero movies are the new serials, except amped up into Red Bull equivalents of tune-in-next-year. When will “next year” end? Never, as long as the popcorn and box office sizzles.